Pianist and assistant professor of music at ELAC, Lucy Nargizyan, will perform at the All-Russian chamber music concert series at the Walk Disney Concert Hall next month. Nargizyan, along with violinist Mark Kashper and cellist Barry Gold, will perform Dmitri Shostakovich’s “Piano Trio No. 2,” which Shostakovich composed when he was 19 years old. 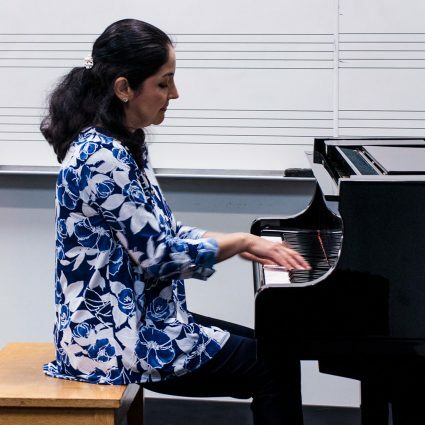 Performing a portion of the piece by herself would be unfair to the music, Nargizyan said, because it is meant to be played with other people. “When we play in a chamber music setting, it’s the collective interpretation— so you have to agree on many aspects,” Nargizyan said. Between teaching at ELAC and focusing on her own trio called The Elixir Trio, her schedule has prevented her from taking on extra work. When she received the invitation however, she said, she couldn’t pass up the opportunity. Though Nargizyan is excited to play the Walt Disney Concert Hall, she enjoys teaching students about music and performing. “As much as I love performing, the teaching part, being connected to the students here, is just so meaningful,” Nargizyan said. Every week, students get to perform in the recital hall, allowing them the opportunity to practice performing in front of an audience. “It’s one thing to practice on your own or to play for your teacher in the studio; It’s another thing to go on stage and deliver,” Nargizyan said. The “All-Russian” concert takes place at the Walt Disney Concert Hall Tuesday, October 2 at 8 p.m. For tickets, visit www.laphil.com.